Discovered in the mid 1950s, Don and Phil Everly recorded and wrote many country inspired songs, but not until they hooked up with songwriter husband and wife Felice Bryant and Diadorius Boudleaux Bryant and recorded a song hat had been turned down 30 times by other performers, “Bye Bye Love”, did they break huge onto the late fifties R&R scene. Other global hits with songs from the Bryant’s were “Wake Up Little Susie”, “All I have to do is dream”, “Bird Dog”, “Love Hurts” plus another 2 dozen or so, catapulting the Everly Brothers into a phenomenon of early Rock and Roll, reaching almost the size of Elvis’ fame. Both brothers became skilled songwriters as well, which allowed them to keep their music career going through the first couple of years in the sixties, as they signed a 10 year contract with Warner Bros in 1960. First of the bat in that year they wrote and performed “Cathy’s Clown”, which sold 8 million copies. Forced enlistment in the US Marine Corps Reserves in October 1961 can be pinpointed as the beginning of their decline. They never stopped working as a duo but their last United States Top Ten hit was 1962’s “That’s Old Fashioned”. 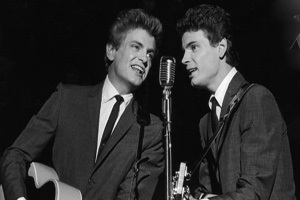 The Everly Brothers had 35 Billboard Top-100 singles, 26 in the top 40. They hold the record for the most Top-100 singles by any duo, and trail Hall & Oates for the most Top-40 singles by a duo. In the UK, they had 30 chart singles, 29 in the top 40, 13 top 10 and 4 at No. 1 between 1957 and 1984. They had 12 top-40 albums between 1960 and 2009. In 1986, the Everly Brothers were among the first 10 artists inducted into the Rock and Roll Hall of Fame. They were introduced by Neil Young, who observed that every musical group he belonged to had tried and failed to copy the Everly Brothers’ harmonies. He was two weeks short of his 75th Birthday when he died from emphysema and bronchitis on 3 January 2014.